On the 3rd of August, we celebrated the graduation of 60 Galilee scholarship students. 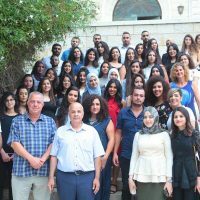 The ceremony was held in Nazareth and graduating students from various universities came together to celebrate their achievements. Please spare a few minutes to watch this short video which summarises the three-year journey of the Scholarship Programme and the positive effects it has had on our students and their communities. Below are also some of this year’s volunteering activities which our students participated in during their scholarships. Students visit the village of Aujan, in the Naqab in Southern Israel. Aujan is considered an unrecognised city. The indigenous Palestinian population in the Naqab have the lowest education levels and incomes, the highest infant mortality and the highest unemployment rates in the country.